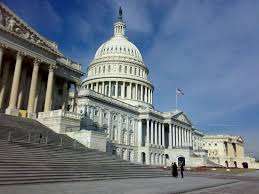 A preliminary draft proposal for a federal online-gambling ban is currently being floated in the corridors of Congress in Washington, D.C., with the uncredited proposal including carveouts of several types, including one for both intrastate and interstate online poker. A quick cleaning and re-reading of the text shows that in addition to the poker carveout, the draft proposal also contains the seed for a federal Congressional attempt to usurp traditional “states rights” control over gambling matters and reassign them to federal control, a matter that will no doubt raise protests by numerous state governments. According to the proposal, “Although States, under our Federal system, are due substantial deference when it comes to regulation within their borders, the Internet by its nature is an instrumentality of interstate commerce and its regulation appropriately lies within Federal purview.” This is actually a sweeping statement with applications far beyond i-gambling concerns. As for prospects for the proposal, those are likely dim. As Chris Grove at OPR noted in a brief piece on the proposal, “Any federal action on online gambling remains highly unlikely,” due to election-year concerns. A similar cloud hangs over who might have been responsible for the proposal, though it appears to be a compromise measure designed, and as Grove noted, is reasonably close to the Republican-centric views regarding online gambling promoted by US Sen. Dean Heller (NV) and others. Had this been floated five years ago, its chances would have likely been much greater; despite the affront to states, the rest of the proposal is a reasonable compromise in several ways. Yet today, it’s likely too little, too late. Purpose: To prohibit Internet gambling in order to protect consumers and the public interest. SHORT TITLE.—This Act may be cited as the “Internet Gambling Prohibition and Control Act of 2014”. SEC. 101. FINDINGS OF CONGRESS. (1) Illegal Internet gambling results in the proliferation of gambling activity, increases in gambling addiction and other socially undesirable behavior. (2) Subchapter IV of chapter 53 of title 31, United States Code, which was added by the enactment of the Unlawful Internet Gambling Enforcement Act of 2006 (title VIII of Public Law 109–347; 120 Stat. 1952) (the “UIGEA”), makes it a Federal crime for gambling businesses to knowingly accept most forms of payment in connection with the participation of another person in unlawful Internet gambling. That statute was intended to convey Congress’s clear opposition to Internet gambling by providing help to enforcement efforts against unlawful Internet gambling operators and to limit unlawful Internet gaming involving United States persons. (3) At the time of the UIGEA’s enactment, it was clearly understood that section 1084 of title 18, United States Code (referred to as the “Wire Act”), along with other United States laws such as sections 1952 and 1955 of title 18, United States Code (the “Travel Act” and “Illegal Gambling Business Act”, respectively), prohibited Internet gambling. (4) Notwithstanding that understanding, on December 23, 2011, the Department of Justice released a memorandum opinion of the Office of Legal Counsel dated September 20, 2011, that reversed the Department’s longstanding position by construing the Wire Act to apply only to sports-related gambling activities in interstate and foreign commerce. (5) That opinion has led to the further proliferation of gambling offered by offshore operators, as well as state legislation, some enacted, that will permit Internet gambling not only within the respective States but possibly foreign jurisdictions – as well. (6) Although States, under our Federal system, are due substantial deference when it comes to regulation within their borders, the Internet by its nature is an instrumentality of interstate commerce and its regulation appropriately lies within Federal purview. (1) INDIAN LANDS AND INDIAN TRIBE.—The terms “Indian lands” and “Indian tribe” have the meaning given the terms in section 4 of the Indian Gaming Regulatory Act (25 U.S.C. 37 2703). (2) LICENSED FACILITY.—The term “licensed facility” means any facility that provides casino gaming to persons located on a riverboat, at a race track, or in another facility, regardless of the number of gaming devices in one physical location, pursuant to a duly authorized license issued by a gaming regulatory authority of a State or Indian tribe. (ii) are lawful in the State or on the Indian lands in or on which each casino gaming facility is located. (iv) in which the person operating the game may assess a commission fee (commonly referred to as a “rake”) or any other type of fee. (B) POKER TOURNAMENTS.—The term “poker” includes poker tournaments in which players pay a fee to play against each other, including tournaments where the licensee guarantees a minimum tournament pot. (5) PRIZE.- Any gift, award, gratuity, good, service, credit or anything else of value which may be awarded to a person based on the outcome of a game, whether or not possession of the prize is actually awarded or placed on an account or other record as evidence of the intent to award the prize. “Prize” shall not include free or additional play or intangible or virtual prizes that cannot be converted into money or merchandise. (F) which is not an online lottery game that is intended to mimic or does substantially mimic a gaming device, slot machine, poker, or any other casino game. (7) STATE.—The term “State” means each of the several States of the United States, the 1 District of Columbia, and any commonwealth, territory, or possession of the United States. SEC. 103. WIRE ACT CLARIFICATION. (2) the term “any sporting event or contest” includes games in material part or predominantly subject to chance which are played for a prize, including games in which players compete against each other, and not against any person, entity, or fellow player hosting the game, the outcome of which, over any significant interval, is predominantly determined by the skill of the players. SEC. 104. UIGEA CONFORMING AMENDMENTS.